“Perilous Position of HMS ‘Terror’, Captain Back, in the Arctic Regions in the Summer of 1837" by William Smyth R.N. The ‘Terror’ survived this journey to the Arctic, but it never returned from the 1845 Franklin Expedition. In 1845, Sir John Franklin led two British Royal Navy ships on an ill-fated expedition through the Northwest Passage—a famous and hazardous corridor connecting the Atlantic and Pacific oceans. None of the crew members returned, spawning a mystery that has endured for more than 150 years. A new analysis explores the various ways in which the sailors could have met their demise—including a rare disease historians hadn’t considered before. 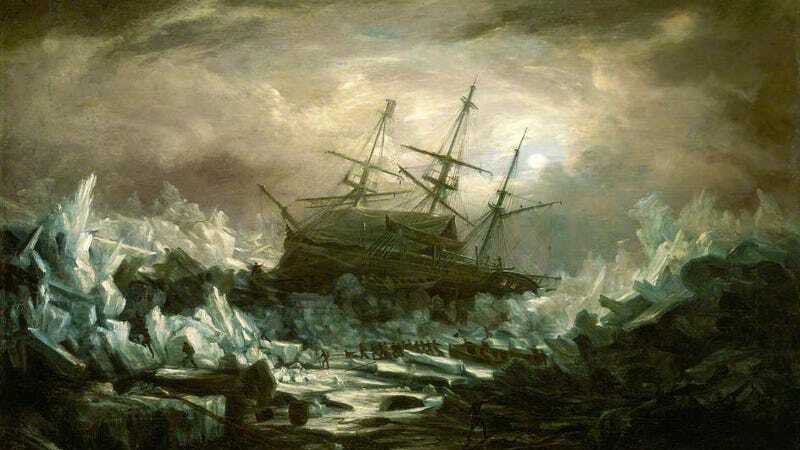 To say that the 129 sailors aboard the HMS Terror and Erebus died slow and miserable deaths would be a gross understatement. As they attempted to traverse the last unnavigated section of the Northwest Passage, the ships became hopelessly trapped in ice above the Arctic Circle off Canada’s King William Island. For the next two years, the crew members struggled to stay alive, eventually succumbing to a variety of ailments. Among historians, the generally accepted causes of death include exposure, scurvy, lead poisoning, botulism, tuberculosis, and starvation. A new study published in the journal Arctic affirms these earlier conjectures, while adding a new and unexpected cause of death: tuberculosis resulting in adrenal insufficiency, or Addison’s disease. This latest investigation into Franklin’s Lost Expedition was authored by Russell Taichman, a University of Michigan dentistry professor, who drew upon his expertise in oral health to establish the likely causes of death. The Schwatka expedition (1878–80) documented that several Inuit families had observed sailors of the Franklin expedition dragging ship’s boats in Washington Bay on the southwest coast of King William Island, Nunavut, Canada. The Inuit reported that the men appeared thin and the mouths of some of them were hard, dry, and black. Many Franklin scholars believe from this description that the surviving crews were suffering from scurvy and possibly lead poisoning. Armed with these scant clues, Taichman decided to investigate the prevailing cause-of-death theories, and study how each condition may have affected the sailors’ oral cavities. With the help of University of Michigan librarian Mark MacEachern, Taichman cross-referenced the crew’s physical symptoms with known diseases and analyzed over 1,700 medical citations. To his surprise, Addison’s disease kept popping up during the analysis. People suffering from Addison’s have trouble regulating sodium, so they get dehydrated easily. The disease also makes it difficult to maintain weight, even when food is available. Together, these two symptoms, argues Taichman, helps to explain the wasting condition of the crew, and particularly their oral cavities, as documented by indigenous peoples. Scurvy, a deficiency of vitamin C, was definitely also problem for the doomed crew members, but Taichman says this disease couldn’t possibly be responsible for all the deaths. Lead poisoning—confirmed by an analysis of recovered bones—may have come from lead solder used for the cans and from lead pipes that distilled water for the crew. It’s an intriguing finding, and it helps us better understand what went on during the expedition’s final days. One thing we’ll never know, of course, is the mental state of these stranded sailors. Marooned for two years in Arctic ice, the survivors pressed on until the bitter end. Ultimately, it was disease that triumphed over these men—and admirably, not a lack of hope.